SubhaanAllah, how humbling it is to think deeply about our origin! A time for her to humble herself before Rabb-al-‘Aalameen (Rabb of the Universe). A time to show gratitude at the level of the heart, tongue and limbs. A time to remove any traces of arrogance and ingratitude from the heart. As motherhood begins, it brings with it challenges as well as rewards. Part of the gratitude is to accept the responsibility and accountability that comes with the blessing of this bundle of joy. In Surah Shu’ara we find the beautiful words Ibrahim (عليهِ سلام) uses to introduce Rabb-al- Aalameen. Alongside this recognition of Allah (سبحانه وتعالى) his du’a reflects his gratitude and focus on being ultimately successful in terms of aakhirah. Hence, the realistic perspective regarding blessings of the dunya (world) and significance placed on soundness of the heart. The following passage from the Qur’an of Surah Shu’ara verses 78-89 serves as an important reminder for any woman who experiences the blessings and challenges that come with motherhood, whether young or old! 79. And it is He who feeds me and gives me drink. 80. And when I am ill, it is He who cures me. 82. And who I aspire that He will forgive me my sin on the Day of Recompense. 83. [And he said], “My Lord, grant me authority and join me with the righteous. 84. And grant me a reputation of honor among later generations. 85. And place me among the inheritors of the Garden of Pleasure. 86. And forgive my father. Indeed, he has been of those astray. In the winter of 2009, I found that I was expecting my 3rd child. I was in the middle of my journey as a Student of the Qur’an and was a little overwhelmed about how everything was going to work out. Alhumdulillah! I realized that everything is part of Allah (سبحانه وتعالى)’s planning and with this recognition a kind of serenity and peace descended upon me. Despite the nausea and pregnancy discomfort, I felt content throughout my pregnancy. I continued my role as a student as much as I could, knowing my child is witnessing the Qur’an. I believe the aathar (traces) prevalent in my daughter, Salwa, who is now 15-months old, Masha’Allah. She was lucky to experience the Qur’an the way she did. She used to hear it everyday in the morning when she came to class with me, before and after she was born. She was one of the youngest students of the Qur’an! Also, I feel that now whenever the Qur’an is played, she is very responsive, alert and recognizes the words. I wish every child has an opportunity to experience the Quran, the way she has! What a miracle it is to have a life within life itself!. SubhanAllah! It is also amazing how nutrition is reaching my baby through me. Another wonderful experience for me was when the baby started kicking after the fifth month. I try reading about the baby’s development weekly. Around the 26th week (6th month), the baby’s hearing capabilities are developed. I have been trying to recite and listen to the Qur’an. Now that I am close to the 9th month, I have been trying harder to recite more and more of the Qur’an to make my baby listen to the words of Creator. I also want my baby to be in the company of those who study the Qur’an. As the child in the womb can listen, I am happy when my neighbours come over to study the Qur’an with me and when two kids come to learn salah. I want and pray for my baby to love Allah (سبحانه وتعالى), Rasul Allah (صلي اللهُ عليهِ وسلم)  and the Qur’an more than anything else, In sha’Allah. The following ayah reminds me that like Maryam (عليهِ سلام)’s mother, I too should seek Allah’s protection for my child. I have also been reading du’a for having a righteous child. Having a child is a blessing; however every blessing is a test so I feel I need my Creator’s help in raising my kids as good Muslims. Recently, I attended a lecture by a scholar who replied to my question of tips for raising good Muslims. He said that we (parents) have to be the role models and also that the Masjid should be their second home. I never really reflected much on the ayahs that talked about the creation of man till I became pregnant. I’m sure every pregnant woman or one who has given birth has gone through the same. Now that I’m pregnant, whenever I would come across such ayahs, I start thinking now my unborn baby is at the stage of an alaqa or a mudgha. Every week I go online and see pictures of what the embryo or fetus looks like at a specific week. It’s really amazing how a small clot turns into flesh and the different stages transformation it takes each week. 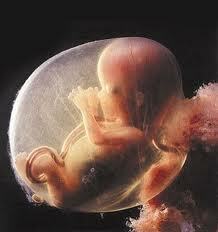 The embryo having no distinct feature gradually turns into a fetus with clearer human like features. What is also miraculous is the fact that a Divine Scripture details out facts which science proves today and is able to give images of! SubhanAllah! Allah (سبحانه وتعالى) grants us such a great blessing and He doesn’t stop there. He nourishes it for nine months and causes it to miraculously grow within us. From a nutfah, Allah(سبحانه وتعالى) brings out a child. The creation of man is one of the greatest miracles of Allah (سبحانه وتعالى) and points to His Power and Might. The fact that the whole process of how a child is formed in the womb was mentioned to us over 1400 years ago leads us to the realization that indeed Islam, the Final Messenger and the word of Allah (سبحانه وتعالى) are all true. While Allah (سبحانه وتعالى) nourishes our children within us, it becomes our duty to provide our children with nourishment (especially religious) after it is born. With such a great blessing, there also comes a huge responsibility our way. This entry was posted in Media Presentations, Signs in the Universe and tagged Biology, Birth, Creation of Man, Islam, miracle, Muslim, Pregnancy, Science, Signs in the Universe, Stages of Birth. Bookmark the permalink. This is a very interesting article about the creation of man and how a baby is born inside the mother’s womb and in how many stages. It is amazing how Allah has created us yet we sometimes don’t thank him for the blessings he has bestowed upon us. Getting connected with the Quran is so beautiful! It beautifies our perspective, therefore making every aspect of life a learning experience, and one that will bring us closer to our Rabb. May Allah (SWT) give us all the ability to bring up our children in a manner that He likes iA, amen.